The Highland Area Community Foundation is excited to announce that donors can now quickly and easily support the Foundation by donating ONLINE. Below you will find a list of Funds that are eligible for online donation. Be sure to click the DONATE button associated with the fund you would like to support. You will be taken to the HACF Paypal page where you can confidently and securely complete your online donation. 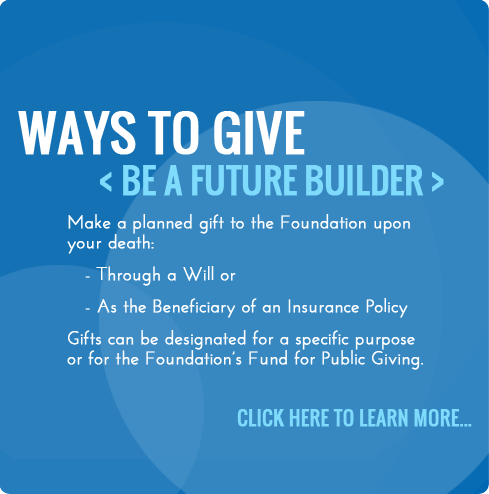 Gifts from the following to the endowment’s unrestricted Fund for Public Giving will allow the Foundation to perform a critical part of its mission - identifying and responding to community needs. This designated fund was established February 28, 2000, to benefit the operations of the Korte Recreation Center. This fund is the "General Fund" of the fund-raising campaign for all miscellaneous donations. Individuals, organizations, and corporations can contribute to the Administrative Fund this year to provide ongoing administrative, growth and marketing support for the Foundation. The Sustaining Membership Program has various levels of membership – with your annual pledged gift going directly to the general grants program each year. See below for membership levels. This pass through fund was established March 2001 with funds remaining after all Recreation Center construction bills were paid. These funds are available for special needs for the Korte Recreation Center/Glik Park area as approved by the Mayor and City Manager. This pass through fund was established October 2, 2001, to allow for tax-exempt contributions to be made to provide the Highland area with high quality, affordable live theatre productions and arts education. This pass through fund was established May 1, 2003, to allow for tax-exempt contributions to be made to increase the awareness of and to promote the arts in the Highland area. This pass through fund was established May 19, 2003, to allow for tax-exempt contributions to be made for the purpose of educating, promoting the awareness of, and providing enjoyment of horticulture for students of the Highland Community Unit School District #5 and the community. Fund terminated September 27, 2010. This pass through fund was established May 19, 2003, to allow for tax-exempt contributions to be made to promote the improvement of the City Square area. This pass through fund was established June 11, 2003, to provide annual scholarships for Highland High School seniors. Fund no longer active effective July 2015. This pass through fund established March 4, 2004 and previously known as Friends of Friends Fighting Cancer Fund, was revised March 20, 2014 changing the name to Melissa Brown Friends of Friends Fighting Cancer Scholarship Fund and will provide scholarships to Highland High School graduating seniors pursuing a degree in the medical field. This pass through fund was established July 14, 2005, to allow for tax-exempt contributions to help provide a safe after-school atmosphere for children K-6 grade. T.A.K. serves Grantfork, Alhambra, and New Douglas area. This pass through fund was established September 6, 2007, to allow for tax-exempt contributions for an Eagle Scout’s project of putting a helicopter pad on Highland School property for the community’s use in landing of emergency helicopters. This Fund was terminated April 19, 2016. This pass through fund was established March 3, 2008, to benefit the Knights of Columbus charitable giving programs. This pass through fund was established December 11, 2008, to benefit the Meals on Wheels Program at St. Joseph’s Hospital, Highland, Illinois. This pass through fund was established August 18, 2009, to benefit Glik park and various Flower Gardens in Highland. This pass through fund was established August 4, 2010. This fund will distribute funds at various times, and for various amounts, at the discretion of Ralph Korte or his designee. Fund terminated March 14, 2014. This pass through fund was established August 17, 2010, to allow for tax-exempt contributions for an Eagle Scout’s project of recognizing deceased first responders (fireman, police, EMT, etc.) in the community with gravesite markers. This pass through fund was established September 28, 2010. This fund will distribute funds at various times, and for various amounts, at the discretion of Donald R. Johannes, or his designee. This pass through fund was established September 30, 2010, for the purpose of receiving donations for the remodeling/renovation, etc. of the Louis Latzer Memorial Public Library. This pass through fund was established December 2, 2010, to allow for tax-exempt donations of new construction/remodeling of St. Joseph’s Hospital, Highland, IL and for special projects at St. Joseph’s Hospital as approved by the Board of Directors. This pass through fund was established February 15, 2011, to allow for tax-exempt donations of various City of Highland sponsored “Special Events”. This pass through fund was established February 28, 2012, to allow for tax-exempt donations to be used for the Highland Home -new construction, remodeling, or special projects. This pass through fund was established September 8, 2012, for the purpose of funding scholarships to students attending a trade/vocational school and scholarships for St. Paul Grade School. This pass through was established January 17, 2013, for maintenance and upkeep of Anderson Cemetery, St. Jacob, Illinois. This pass through fund was established February 12, 2013, to distribute funds at various times and in various amounts to 501(C)(3) qualified recipients and charitable organizations at the discretion of John Duft and June Blaine. This pass through fund was established March 27, 2013, for the purpose of providing recreational and competitive opportunities for individuals with intellectual disabilities. This pass through fund was established March 28, 2013, to provide scholarships for students of Triad High School, Troy, IL; Staunton High School, Staunton, IL; and Lewis & Clark Community College, Godfrey, IL; who are majoring in Criminal Justice Studies. This pass through fund was established May 15, 2013, for the purpose of awarding a scholarship(s) to a young woman in her senior year of high school living in the Highland School District who shows promise of civic-mindedness as evidenced by her goals, leadership, and services in her school and community. This pass through fund was established June 21, 2013, for the purpose of providing scholarships to HHS graduating seniors who are furthering their education in the field of the arts. This pass through fund was established October 30, 2013 to promote and preserve the tradition of choral music for cultural enrichment of the Highland, IL area. This pass through fund was established December 5, 2013, for the purpose of doing charitable works in the Highland Area Community Foundation’s service area. This pass through fund was established December 27, 2013 to provide scholarships for graduating seniors of Highland High School pursuing a bachelor’s degree in Engineering or Chemistry and Nursing. Fund terminated December 3, 2014, with scholarships now available from Carl and Kathleen (Iberg) Ernest Scholarship Named Fund. This pass through fund was established February 2, 2014 to benefit charitable needs and award scholarships to Highland High or Mater Dei High School seniors. This pass through fund was established November 13, 2014 to provide scholarships to graduates of Highland High School who are pursuing a degree in Education. This pass through fund was established December 16, 2014 to distribute funds at various times and for various amounts at the discretion of donor. A part of this fund is to provide scholarships to 8th grade graduates to attend Fr. McGivney Catholic High and Mater Dei Catholic High and to Highland High School graduates to pursue a vocational education program. This pass through fund was established December 18, 2014 to distribute funds at various times and for various amounts to 501c(3) qualified recipients and charitable organizations at the discretion of donor. This pass through fund was established March 10, 2015 to distribute funds at various times and amounts to supplement their designated scholarship fund. This pass through fund was established October 28, 2015 to provide scholarships to graduating Highland High School seniors to pursue an education in one of the named therapy skills (Physical Therapy, Occupational Therapy, Speech Therapy, or Sports Medicine). This pass through fund was established December 14, 2015 to distribute funds at various times and amounts to 501©3 qualified recipients and charitable organizations at donor’s discretion. These funds may also be used for sponsoring seminars, advertising or materials related to drug prevention. This pass through fund was established March 24, 2016, to support the growth of recreational and competitive tennis programs in the Highland area. This pass through fund was established April 27, 2016 to provide scholarships to HHS graduating seniors attending SIU-E. This pass through fund was established June 28, 2016 to provide scholarships to Highland High School female graduating seniors. This pass through fund was established September 20, 2016 to allow tax exempt contributions for future Highland Special Celebrations such as (or similar to) the Bicentennial, the Sesquicentennial, etc. This pass through fund was established September 27, 2016, to provide a scoreboard and other improvements to the Baseball Diamond in Glik Park known as “Optimist Field”. This pass through fund was established November 17, 2016 to support the construction of a Veterans Memorial Kiosk to honor veterans, police, firefighters, and first responders. This pass through fund was established January 12, 2017 to provide aviation related scholarships to candidates (suggested ages 9 years – 18 years of age or Grade 4 through 12). This pass through fund was established January 20, 2017 to provide charitable works such as donations to organizations geared toward helping youth and those in need, and to provide training, testing and equipment vital to promoting cardiac care. This pass through fund was established March 8, 2017 to provide for the completion of the Jaycee Dog Park located on Veterans Parkway, Highland, IL which will provide a safe exercise and play area for pets to run free. This pass through fund was established March 23, 2017 to provide scholarships to Highland High School graduating seniors who will pursue further education in the Arts, the Medical Field, or at a Trade School favoring the Restaurant Management profession. This pass through fund was established May 24, 2017 to provide for the building, renovations, up-grades and maintenance of both north and south ball fields on the Knights of Columbus property. This pass through fund was established September 29, 2017 to provide scholarships for HHS graduating seniors. This pass through fund was established November 17, 2017 to provide HCUSD#5 with support for the Special Education Department. This pass through fund was established December 19, 2017 to provide for construction, purchase of various playground equipment, etc. for an all-abilities playground/park. This pass through fund was established established April 26, 2018 to support St. Vincent DePaul Society of St. Paul Catholic Church, Highland, Illinois. This pass through fund was established December 18, 2018, with funds from their Pledged Fund to benefit the Fine Arts Program of Highland High School, Highland, IL. This pass through fund was established December 21, 2018 for the purpose of providing help to the L.U.N.C.H. Bunch mission of addressing food insecurity by providing good nutrition, as well as the development and social needs of the children and families of the Highland Community School District #5. This pass through fund was established January 8, 2019, to provide scholarships for graduating seniors from Highland High School, Mater Dei Catholic High School, Fr. McGivney Catholic High School, or Triad High School with a Highland, IL mailing address. This pass through fund was established March 17, 2019, to provide charitable works such as donations to organizations geared toward helping to find a cure for CDH (Congenital Diaphragmatic Hernia). The following funds are all Recreation Center Funds and have been established to benefit the operations of the Korte Recreation Center. The following funds have been established by people who care about our community and have chosen the Highland Area Community Foundation to help them make a difference. This field of interest fund was established February 26, 1998, by Rita Hardy in memory of Bob Hardy, Sr. for the beautification and enhancement of the City of Highland. This unrestricted fund was established May 5, 1998, by Brian & Evelyn Randall for charitable purposes as may be determined by the Foundation’s Board of Directors in furtherance of the purposes of the Foundation. This unrestricted fund was established August 21, 1998, by Brenda Mersinger for charitable purposes as may be determined by the Foundation’s Board of Directors in furtherance of the purposes of the Foundation. This donor advised fund was established September 14, 1998, by the Highland Civic Woman’s Club in memory of Geralyn M. Rehkemper. The purpose of this fund is to provide scholarship grants to an educational institution providing the education or training of an individual seeking higher education. This unrestricted fund was established November 12, 1999, in memory of Orville & Alma Streiff for charitable purposes as may be determined by the Foundation’s Board of Directors in furtherance of the purposes of the Foundation. This designated fund was established March 6, 2000, in memory of Nan Carpenter. The purpose of this fund is to benefit the Hospice of Southern Illinois Inc., for service provided in the Foundation geographic area. This donor advised fund was established March 6, 2000, in memory of Nan Carpenter. The purpose of this fund is to provide needed assistance and medical programs provided by St. Joseph’s Hospital of Highland or another not-for-profit health care provider serving the geographical area of the Foundation. This unrestricted fund was established March 6, 2000, in memory of Nan Carpenter for charitable purposes as may be determined by the Foundation’s Board of Directors in furtherance of the purposes of the Foundation. This designed fund was established June 12, 2000, to benefit the Louis Latzer Memorial Public library for general library purposes as determined by the Board of Directors of the Library. This designated fund was established August 17, 2000, to help less fortunate families to better use the Korte Recreation Center. This donor advised fund was established August 9, 2001, to provide scholarships for graduating seniors of Highland High School, Highland, Illinois. This donor advised fund was established August 11, 2001, to benefit non- sports programs that will be administered by the Highland Parks and Recreation Department. This designated fund was established October 28, 2002, to benefit the patrons of the Louis Latzer Memorial Public Library. This unrestricted fund was established July 10, 2003, in memory of Dr. Edwards L. Hediger and Edward G. Hediger for charitable purposes as may be determined by the Foundation’s Board of Directors in furtherance of the purposes of the Foundation. This designated fund was established July 12, 2004, to provide water safety lessons, including instructions in swimming and boating, as well as lifeguard training, and water therapy at the City of Highland facilities. This designated fund was established December 29, 2004, to benefit the Foundation’s General Grants Program. This designated fund was established June 30, 2005, for charitable purposes as determined by the Foundation’s Board of Directors in furtherance of the purposes of the Foundation. Previously a donor advised fund established September 18, 2007, to provide scholarships, this fund was changed to the Bill and Joan Sackett Fund June 21, 2012, to benefit the Operations of the Foundation. This donor advised fund was established March 5, 2008, to benefit the charitable giving programs of the Highland Knights of Columbus. This designated fund was established November 21, 2008, and benefits the general grants program. Fund terminated December 18, 2018 with fund balance transferred to newly created fund, Jay W. and Catherine T. Boulanger Louis Latzer Memorial Public Library Benefit Fund. This designated fund was established December 16, 2008, in memory of Peggy Pierce, to provide scholarships and/or educational assistance for second year (or above) Criminal Justice students or scholarships and/or specialized law enforcement training for existing law enforcement officers. This designated fund was established December 23, 2008 to provide scholarships for future teachers (K-12) from the Highland Community Unit School District #5, and to provide books and technology to support the curriculum in Grades K-6. This designated fund was established December 31, 2008 and benefits the general grants program. This designated fund was established June 11, 2009, to benefit the Relevant Pregnancy Options Center’s (formerly Pregnancy Care Center) various client programs. This designated fund was established September 22, 2009, to benefit the St. Paul School Music and Technology programs. This designated fund was established November 25, 2009, to benefit the Relevant Pregnancy Options Center’s (formerly Pregnancy Care Center) various client programs. This donor advised fund was established December 2, 2010, to provide scholarships for future teachers and school administrators from Highland Community Unit School District #5, as well as to provide materials to enhance the joy of reading in children. This designated fund was established October 6, 2011, to benefit the operations of the Foundation. This designated fund was established December 27, 2011 to benefit various organizations- Highland Historical Society, Highland Animal Shelter, Meals on Wheels and Hospice of Southern Illinois- on a rotating basis. This designated fund was established June 6, 2012, to benefit St. Joseph’s Hospital. This designated fund was established February 6, 2013 to provide scholarships for graduating eighth grade student parishioners of St. Paul Roman Catholic Church, Highland, IL to attend Fr. McGivney Catholic High School, Maryville, IL. This designated fund was established March 28, 2013, to provide scholarships for students of Triad High School, Staunton High School, and Lewis & Clark Community College who are majoring in Criminal Justice system. Fund terminated January 14, 2014, with fund balance transferring to the Trooper Kyle Deatherage Scholarship Pass Through Fund. This designated fund was established August 30, 2013 to provide scholarships for graduating Highland High School Seniors. This designated fund was established December 19, 2013 to benefit operations of the Foundation. This designated fund was established December 27, 2013 to provide scholarships for graduating seniors of Highland High School CUSD#5 pursuing a degree in (1) Engineering or Chemistry and (2) Nursing. This designated fund was established December 16, 2014. The use of fund proceeds is to be determined. This designated fund was established January 16, 2015 to benefit the general grants program. This designated fund was established September 23, 2015 to benefit the general grants program. Fund terminated December 18, 2018 with fund balance transferred to newly created fund, Jay W. and Catherine T. Boulanger Louis Latzer Memorial Public Library Benefit Fund. This designated fund was established December 21, 2015 to benefit the Missionary Society of St. Therese. This designated fund was established November 18, 2016 to benefit the general grants program. This designated fund was established January 3, 2017 to benefit the general grants program. This designated fund was established April 6, 2017 to benefit the general grants program. This designated fund was established January 16, 2018, to benefit the general grants program. This designated fund was established April 9, 2018 to benefit the Keystone Cemetery Association, St Jacob, IL. This designated fund was established December 18, 2018, with funds from two of their previous funds, to provide an annual grant to be used for needs of the Library, such as books, media, technology, physical construction, or other improvements approved by the LLMPL Board of Directors. This designated fund was established December 11, 2018, to benefit the general grants program. 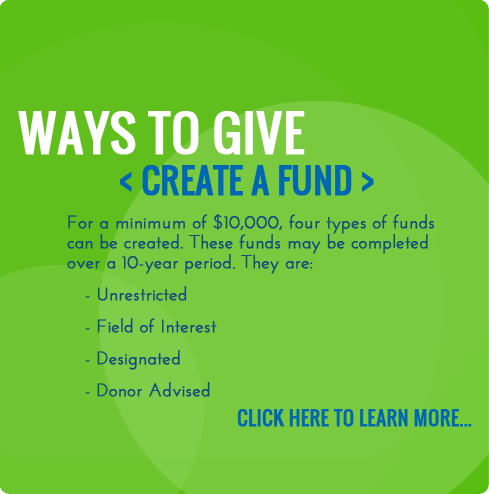 For a minimum of $10,000, four types of funds can be created. These funds may be completed over a 10-year period. The funds listed below are currently working towards being fully-funded. This fund will be designated upon completion.